The Boss is back! Or at least David Brent is back! And it would appear that a good idea, may indeed be a good idea forever. It has been twelve years since the BBC's award winning, at times cringe worthy, hilarious, sad, all too real, surreal and touching sit com mockumentary The Office ended its two and half season run. Incredibly it's UK run of only 14 episodes belies the cultural significance and impact that the show has had, (the US version of the The Office ran for nine seasons!!) as co directors and writers Ricky Gervais and Stephen Merchant turned their magnifying glass on the microcosm of office life - personalities and relationships, at times possibly cutting a little too close to the bone. I can't deny I have been curious about what has happened to the personalities of The Office over the last decade. Did Dawn become a world renowned children's book illustrator? Did Tim and Dawn finally got their happy (or mildly content) ever after. Did Gareth slog it out or quit to start his own private investigation business, join the TA or campaign to become the President of the Unites States? Did he ever find a boy that could swim faster than a shark? And what of David Brent our relentlessly hopeless, inappropriate and awkward every man? He may be refreshingly laid back for a man with such responsibility but did he finally follow the success of Richard Branson or Tony Robbins? Or a different path? Well unless you have been living under a rock (and roll branded pillow) for the last couple of months you already know that we will indeed, at least be getting to know a little of what has happened since, as it looks like David Brent has been in the business for another 12 years and spared a moment to tell us what has been happening - when Ricky Gervais releases the big screen debut of David Brent star of The Office (and Slough's finest) in David Brent: Life on the Road into UK cinemas this Friday 19 August. For details on how to get one of these great David Brent: Life on the Road goody packs see further below. DAVID BRENT: LIFE ON THE ROAD sees the highly anticipated big screen debut of one of comedy’s best-loved characters, David Brent (Ricky Gervais). The film catches up with Brent twelve years on from the BBC mockumentary ‘The Office’ to find he is now a travelling salesman with Lavichem, a cleaning and ladies’ personal hygiene products company. However, he hasn’t given up on his dream of rock stardom and is about to embark on a self-financed UK tour with his band, ‘Foregone Conclusion’. Long time Gervais collaborator and David Brent: Life On The Road producer, Charlie Hanson gives some insight on their approach to making the film as well as some information on the production and locations. Filming took place in Central London, Camden, Watford and ended in Slough, an appropriate place to end considering it’s Brent’s home town. Slough is probably not the most exciting place in the UK for Brent to live, but it’s real and it’s what makes Brent who he is. 3 UK Winners will be chosen randomly (by randomly I mean I'll right the contenders names on a slip of paper, place the slips of paper on one of my speakers, push play on one of these Brent classics: Equality Street, Life on the Road, Slough, Lady Gypsy Lady, turn the volume up till it rumbles and the last 3 names left on the speaker by song end are the winners. The judges (meaning my) decision is final. 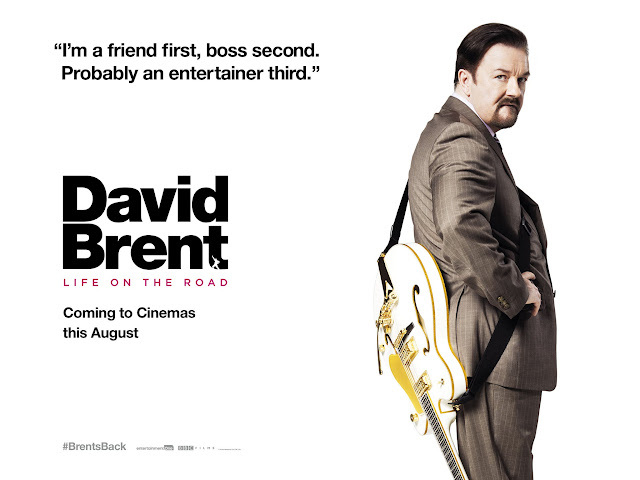 Winners will be chosen and contacted by Monday 22 August, the first Monday after David Brent: Life on the Road is released into UK cinemas.